Registration for the Diabetes Empowerment Summit is Now OPEN! First things first, know that I’m sending you LOTS of love and healing energy towards creating more love and joy in your health and day to day life, now and always! 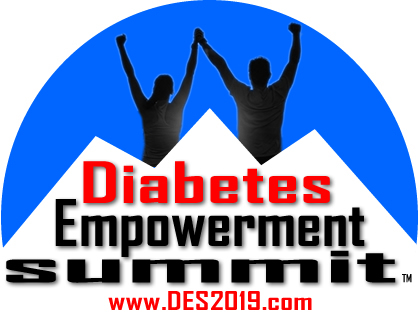 As you can see from my caps lock – I’m INCREDIBLY excited to finally announce that, after months of preparation, registration for the 2019 Diabetes Empowerment Summit is OPEN!!! What is the Diabetes Empowerment Summit? This is our third online event, and the positive feedback we received from our 9+ thousand attendees over the past couple of years has been mind-blowing. An online summit is like attending a diabetes conference that has some of the most high caliber speakers out there, WITHOUT having to pay for conference fees, travel costs, taking time off work, etc. AND getting to pick and choose which presentations are most appealing to you and watching them from the comfort of your own home. All the presenters share their best tools, stories, practices, experiences and more on HOW they cultivate and create an empowered mindset with diabetes, HOW they build confidence in their day to day choices living with diabetes, and also what they teach their patients/clients/readers/followers in the same regard! Why am I (and all the presenters and partners) so passionate about this? The reality of traditional healthcare when it comes to living with all types of diabetes is that the mental and emotional sides of life with chronic disease are almost NEVER addressed EVEN THOUGH without understanding those aspects of our health care we are left feeling unequipped to handle the demands of day to day life with chronic disease and feel alone and ignored. Further, resources covering HOW to cultivate the habits and practices that allow us not only to build a strong, solid emotional foundation to build the rest of our lives on, but those same tools that we need to lean on when we are experiencing difficult times/burnout, are not offered at the doctor’s office even if we ask for them. Without these CRUCIAL tools, we are left to figure this all out on our own. I know because that was my journey with diabetes for so many years. Clinical depression, eating disorder, obesity, shame, guilt, anger, self-pity. That was my everyday experience and mindset for more than 8 years. That is why I am so passionate about creating this resource that is free for everyone to experience. Because it is a tool that I wish I had when I was struggling, and I want to help bridge the gap between traditional healthcare and the emotional tools we all need but are not given at the doctor’s office. We are SO grateful to be partnering with many amazing non-profit organizations and partners who are sharing this resource with their networks because they believe in the value it adds to the community. I believe that the power of collaboration and community are key to helping as many people as possible get the tools they need to live happier and healthier lives through cultivating the practices of self-love, self-care and self-worth. In that light, we are asking that you share this valuable resource with your network – your friends, family, healthcare team, social media groups, and anyone who could use this information. We can only help people if they KNOW this resource exists! Share via email, social media, word of mouth. If you need anything from us to help you with ease of sharing, comment below and let us know! The link to register for free and that you can share is: www.des2019.com AND you get some pretty awesome bonuses just for registering! Share the link, feel free to use my words to describe the event – anything you need. Register now, mark your calendars for May 1st when the summit begins, then share, share, share! As always, let’s consciously choose to be more loving this week, both towards ourselves and those around us, because YOU deserve it, and the world needs as much LOVE as it can get! Have you ever practiced using glucagon either by yourself or with someone else? Taking a few minutes to practice using an expired glucagon kit with a friend of loved one that you live or travel with can be an incredibly powerful way to feel more prepared in an emergency situation. When I was a teenager I needed to have glucagon used on me twice, and I’m forever grateful to my mom and family for acting quickly during a very scary experience. Leave a comment and let me know what you do differently, or if you have a tip that works great for you so we can continue to learn and grow together as a community! [Podcast] I Used to Pinch My Hand Around Baked Goods as a Mental Anchor… What? Will You Join Me & Love Yourself to Health? What Is Love, & What Does It Have To Do With Personal and Financial Health & Wellness?